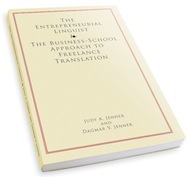 Linguist and author Judy Jenner, who runs Twin Translations in Las Vegas, presented a half-day workshop in downtown San Francisco on April 10 to share some of the lessons she learned in business school and explain how they could be applied to the field of freelance translation and interpreting. Judy focused primarily on marketing basics, but also included segments on economics, accounting, entrepreneurship, and negotiating. One of the first lessons Judy learned in business school was the importance of a marketing plan. Freelance translators and interpreters are, after all, running a business and as Judy put it, need to be “on the same page as lawyers and doctors.” She then went over some of the items that should be on a freelancer’s to-do list, such as a website and professional email address (not Yahoo or hotmail), a professional signature, a professional photo, and a PDF creator so that materials are always sent in PDF format. Letters/pitches to potential customers should be short and to the point, targeted and customized, and make it clear why the customer should hire you as opposed to another translator/interpreter. This last point led to a practical exercise where we were split into small groups to interview each other to determine our individual competitive advantages and share the results with the class. We had to assume that everyone was “good and fast” and come up with some alternative ways to differentiate ourselves. Not as easy as it might seem! Among the advantages people came up with were specializations, credentials, having a partner to edit/proofread a translation, and geographic location (for example, U.S.-based translators can work on a project while their European clients are sleeping). Judy then discussed ways that freelancers can build their own brands and make themselves known. Common ways of doing this include joining professional networks, blogging, Twitter, publishing press releases and/or a newsletter (but only if you have something newsworthy or interesting to say, otherwise it will dilute your brand), and getting a logo to put on business cards and correspondence. With the marketing basics covered, Judy moved on to the economics involved in running a business. The first lesson to be learned is: don’t compete on price. If you really need to give a discount, change the pricing structure, not the price per word (e.g. by not charging for formatting). But remember that clients are seeking value, meaning services they want on terms and conditions that work for them. As for test translations, Judy always charges for them on the basis that the time spent on a test is time that could be spent earning money on another project. Lastly, Judy emphasized the importance of adjusting rates annually to account for inflation. The next topic was accounting. If you don’t have accounting software, you should create a spreadsheet to keep track of income and expenses. It is also essential that your business account be kept separate from your personal account. Be prompt with invoicing and always include your payment terms on your invoice (e.g. “Payment due on…”). For long projects, it is perfectly reasonable to ask for a deposit. It is also important to watch your expenses and look for areas where you can reduce them, such as a less expensive phone service. Judy’s fourth topic was entrepreneurship basics. She talked about the business of referrals and how they work in both directions. It is important to surround yourself with good people. Networking is essential, but there is also a synergy to be gained from “giving back,” – for example, by volunteering. Judy advises incorporating business development into your daily life as you never know where your next client will come from. And when interacting with customers, make it personal: show them you care about their business. Your success depends on the relationships you build. Finally, Judy talked about the all-important skill of negotiating. You, the linguist, set the price. Be firm but prepared to make concessions on things that are not important to you, and never justify yourself. Of course, it may be that you simply need to educate the client, to explain the process to them, and if this is the case, do so gently, without “wagging the finger.” If the client complains about your pricing, use the power of silence. Not saying anything for a few seconds can be very difficult and uncomfortable, but it’s a powerful way to negotiate and often you will find the customer agreeing to your terms. What matters is that you know your bottom line; that is, what you will not negotiate or compromise on, such as the QA process. Nina posted this article under Business, Continuing Ed. on Wednesday, September 1st, 2010 at 12:06 pm	You can follow any responses to this entry through the RSS 2.0 feed. Both comments and pings are currently closed.